A Cleveland municipal court judge has ruled that transit police violated passengers’ constitutional rights when conducting fare enforcement on the HealthLine, the city’s much-lauded BRT route. The decision will slow down the boarding process on the HealthLine for now, but Judge Emanuella Groves laid out a clear way to fix the problem and retain fast boarding procedures: Stop checking fares with law enforcement officers and start using civilian inspectors instead. The HealthLine is a model for rapid bus service in the U.S. Along with design features like center-running bus lanes, the service moves faster because fares are collected via proof-of-payment. Instead of everyone lining up at the front door to pay one by one, HealthLine passengers pay for a ticket before boarding and enter at any door. To keep people honest, the Greater Cleveland Regional Transit Authority uses police officers to conduct random stops and check for fare cards. The case before Groves involved an East Cleveland man charged with fare evasion, a fourth-degree misdemeanor. Ronnie Williams was arrested in July after two police officers boarded a HealthLine bus and demanded all passengers show proof of payment. When Williams could not produce a fare card, he was forcibly removed from the bus and issued a citation. He maintained that he could not purchase a fare card because of a malfunctioning machine and paid the bus driver. He was found not guilty. It was hardly the first time that RTA’s fare enforcement practices have been called into question. A 2010 study by the ACLU found a pattern of racial bias in stops by RTA police officers aboard the HealthLine. Nine out of 10 passengers stopped were black. RTA has since moved toward handling first-time fare evasion cases outside of criminal court, issuing $25 civil fines. Many jurisdictions are decriminalizing fare evasion altogether and shifting entirely to civil fines. But in Cleveland, officers retain the option of charging a criminal misdemeanor, like they did against Williams. Passengers should be left alone, in their private thoughts and spaces, as they travel to their destinations, until individualized, reasonable, articulable suspicion establishes that a specific passenger has committed the offense of fare evasion. If RTA utilized non-law enforcement officers, a constitutional analysis would be unnecessary. The utilization of police officers inappropriately removes the “middleman” or buffer between police and passengers. There must be an intermediary between police and passengers to prevent arbitrary and abusive police encounters. This passage points the way toward a better proof-of-payment system, less subject to dangerous escalation. It would be more akin to parking enforcement, which is conducted as a civil action through uniformed, unarmed traffic officials, not police officers. There is no reason fare evasion should be policed by armed law enforcement officers. RTA spokesperson Linda Krecic told Streetsblog that fare evasion along the HealthLine is not unusually high: between 3 and 5 percent, similar to other routes around the country that use proof-of-payment. She said the agency “is considering its next steps” and “reviewing the impact of the decision.” RTA is now using a combination of station-based inspections carried out by law enforcement and bus-based inspections conducted by drivers. “We are reviewing the way we collect fares and testing this method,” she told Streetsblog. The station-based approach still involves police. Since they can observe people using the ticket-vending machines, it circumvents the legal issue about unreasonable search. The bus-based inspections are similar to standard bus fare payment in American cities — every passenger lines up at the front door to show the driver a ticket. Taking a cue from Groves, Clevelanders for Public Transit is calling on the RTA to decriminalize fare evasion, drop police enforcement of bus fares, and use unarmed civilian inspectors instead. With a saner system of fare enforcement, they say, RTA could then expand proof-of-payment citywide, saving bus riders time on every route. The law here seems problematic. Whether police are used for enforcement or not, this is not the type of thing that should be a “crime” that people can be found “guilty” of. A reasonable person risks losing a ticket and being liable for his or her ride, and paying a fine for such a mistake should be a more than sufficient remediation that will inevitably net some people who didn’t do anything deliberately wrong. For people who deliberately evade paying their fare, it should be equally sufficient. Convicting people of crimes for trivial infractions is the type of boneheaded over-policing that is at the root of many urban social problems. Does it matter who the inspectors are if they’re ultimately working for a public (government) agency? The Fourth Amendment protects us from unreasonable intrusions by the government, not just the police. Going down a rabbit hole here, but then one starts to question the constitutionality of being asked to see your ticket on Amtrak or commuter rail trains. Notably police don’t check for those things, typically. Though also note this seems to be a state constitutional debate (so far), not a federal one. Maybe in one case you have policing (enforcing the law) and the other you have a regulatory activity (the agency enforcing its own rules). But the confusing part is they actually seem to be enforcing a criminal law here, or at least have the option to charge people under a criminal law if they so choose. I do not understand the unconstitutionality of using police officers to check fares. However using the police for this task is overkill. They’re overtrained and expensive for this task. Financially it makes much more sense to hire dedicated fare inspectors. If you read the decision, she explains pretty clearly. I’d be curious to see what would happen on appeal. Asking to see the necessary proof of payment isn’t the same as illegal search IMO. In the San Francisco Bay Area BART has finally implemented Proof of Payment after many complaints from riders. It just sticks in their craw to see so many cheaters do it regularly. There is a larger fine for adults than youths and an adult that violates the rules three times in a twelve month period can be charged with a criminal offense. There is an alternative for youths to do community service as an alternative. This begins in January and for the first month only warnings will be given out. Interesting. Does that mean fare evaders can just run away if inspectors don’t have law enforcement powers? I would just like it treated like insurance. You get the bean counters to calculate the evasion rate at a certain enforcement rate where the revenue recovered by enforcement modestly exceeds the cost of the enforcement plus the total cost of lost revenue due to evasion. In that scenario, you don’t even want a zero percent evasion rate. But as long as discrete evaders pay fines when they’re caught, you don’t care if they keep evading either. I believe the judge is wrong. If, as one would expect, GCRTA has clearly posted signage explaining that riders may be challenged for proof of payment, it is NOT arbitrary. If the cops in question ONLY challenged “likely” fare evaders, THAT would be unconstitutional profiling as well as stupid. The judge incorrectly states that the bus is not a “restricted” area–it is explicitly restricted to persons having paid the posted fare. This is really no different from the Conductor on any train demanding passengers produce either tickets or ticket receipts. There is a further problem in this case. The defendant was reported to have claimed that he paid the driver as the platform TVM was malfunctioning. 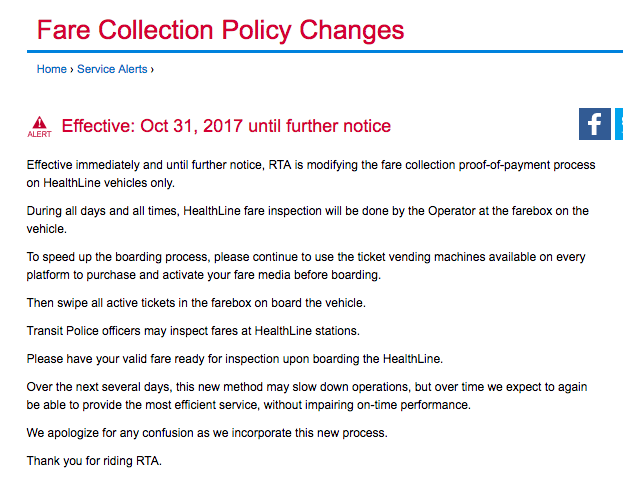 Do GCRTA drivers on the Healthline accept fares? If so, do they not issue receipts? Why could he not produce a receipt? For reference, use of armed officers as POP checkers is common on light rail systems nationwide. While I prefer unarmed “fare checkers” we all know that riders in many cities regularly complain about lack of police presence leading to crime on board. Why can’t the farebox issue a receipt or other proof of payment? That’s how it was done in Vancouver when the buses still used zones. Also, most all the buses in Europe did this when they’d give out change. Some still do. Some other useful context: the fare collection system of GCRTA is absurdly complicated and antiquated. The fare machines are terrible and the payment routines on the light rail, the heavy rail and BRT, and the regular buses, are each different from one another. Sometimes you have to activate fare cards before boarding vehicle, sometimes they are pre-activated. The agency’s web site is atrocious so offers very little help decoding it for occasional riders. Complexity plus non-mechanical cues of when and how to pay are a bad combo. Amtrak doesn’t charge you with a crime if you fail to produce a ticket, though. Yeah, while I understand the judge’s reasoning, the remedy strikes me as worse than the current situation. Checking ALL passengers, while arguably more intrusive, is at least an objective standard. While the judge claims that police should only stop passengers when they have “objective,” reasonable suspicion, I think we all know that leaving such things to human discretion is likely to result in worse outcomes for poor/minority citizens who are often disproportionately targeted by police in other contexts. Her argument is pretty explicitly tied to the 4th Amendment of the US Constitution, no? I think the only mention of the OH Constitution is the provision which makes the 4th Amendment applicable to the state government. Yeah, looks like it is, but it doesn’t seem like an argument that would necessarily prevail outside Ohio state courts? Certainly. But you can’t run away from a moving vehicle and the fare inspector can call ahead and request a police officer to meet at the next stop. At least that’s what the fare inspectors do in my city. The other issue is that Amtrak conductors are not law enforcement officers. There’s the buffer between that and law enforcement. There’s no consensus how the public wants to treat fare evasion. Is it a honor system, like the Metropolitan Museum of Art, where you can just go to the desk and pay as you wish? Is it a parking ticket, which is treated civilly and which most people who drive get at least one in their life, but which every parked vehicle has clear identification (plates and/or VIN) and serial offenders are booted? (How would you boot a serial fare evader?) Or is it like stealing a candy bar at a store, which is shoplifting and subject to arrest and prosecution? Until the public agrees on what the threshold is, you get situations like BART, a fully gated system, employing fare inspectors on trains and the Health Line collecting fares on entry. Many people feel cheated if they see other people not paying. I don’t blame them, especially with transit fares in many cities exceeding $2. POP on BART? It was all faregates when I went last year. I’d be curious to know how many of the people commenting here have actually ridden a bus that uses a proof-of-payment system. I would also be curious to know if the cops check everyone on the bus in Cleveland when they board (as they do on the SBS buses here in NYC) or if they check selectively. The article hints that there’s some kind of racism going on, but without that information, it’s tough to tell whether the author is just pursuing her usual SJW agenda or if this is a real problem. Thy check everybody, but they chose to use sworn law enforcement to do checks rather than civilian inspectors. That’s what the judge had an objection to. It’s POP and fare gates, same as LA Metro subway. BART was not well designed and sometimes elevators go out into unpaid areas, as well as people hopping the three foot fences at stations like Lake Merritt and Downtown Berkeley with impunity. So if they check everyone, how is this a race issue? Are they checking everyone but only issuing tickets to black fare beaters? I get that the judge’s problem was with the uniforms of the officers writing the tickets, which is, in my opinion, ridiculous. Do you think that turnstile jumpers on the subway should only be issued tickets by civilian employees? They are starting to raise the fences. But as you pointed out, the layout of some of the stations wasn’t thought through. At least (and at last) they are starting to put the lock up gates at the top of the stairs/escalators instead of the bottom. It has proved to be a public convenience for the homeless and just ordinary drunks to take a dump after BART has closed for the night. I think the perception arises when the incidence of a particular crime is correlated to race. The result is that more people of that race are arrested and convicted, and then somebody claims that is “racism”. That’s only true if poor/minority people are not the most numerous fare evaders surely? It’s impossible to tell who is evading fares just by looking at them, so in practice we either check everyone OR we look at which demographics are doing this the most and focus on them. So if old Asian women get checked thousands of times and are always found to have paid their fare, do we ignore that correlation and keep checking them anyway just so it looks more “fair”? The fact remains that a civilian has much less power than a sworn LE officer, so at the margin fewer evaders will probably be detained or cited if we use civilian inspectors. In SF, both Muni and BART have uniformed officers (armed in the case of BART) to enforce fare collection. That’s not true. You can be charged with a crime for fare evasion. The key issue is intent. So if you bought a ticket and lose it, then it should be treated as a civil citation only. But if you set out intending to not pay a fare, or in fact always try and not pay your fare, then at some point it becomes a criminal act. It’s theft, after all. Proving intent is hard but not impossible. I know somebody who was arrested and charged for it, although the charge was eventually dropped when he agree to pay the fare plus a penalty. I’ve never seen a fare inspector on a BART train.or station platform. They evidently figure that checking you in and out is sufficient, even though it is clear it is not. You haven’t seen an inspector because, as mentioned, they aren’t starting until January, and for the first month they will only give warnings. Again, if the cops are checking 100% of the riders for proof of payment, we can know the exact incidence of the crime, unlike with other crimes, where the race of the perpetrators and the rate of reporting are unknowns. Could it simply be that something like 90% of the riders on this route are black, and therefore 90% of the people caught for not paying are also black? Seems like a more likely explanation. No, it’s easy to determine such correlations, and in fact the FBI has very detailed demographic breakdowns for each major type of crime. Suppose you stop 100 blacks, whites, Asians and Hispanics at random. You will come up with a percentage of each who evaded the fare. Now, maybe that percentage is the same for each race, in which case you could infer that race is not a determinant. But we’d probably both ponder that might not be the case. The issue is not what percentage of riders are black, but what percentage of fare evaders are black (or whatever race you choose). The more interesting question is what do we then do with that information? Given the choice should we target areas with greater incidences of fare evasion, even if that means picking neighborhoods that are more of one race or another? Or do we try and be PC and check equally affluent white areas even if our records indicate little evasion there, just so we can appear to be PC, and even though we know it is the poorer non-white areas where most evasion happens? The problem with your comparison is that here the people stopped and questioned were not random – it was the entire set of subjects. The equivalent for other crimes would be if the cops stopped and frisked every single person in every neighborhood. I can imagine a handful of potential variables (say, if the cops only stopped the bus in a predominantly black part of town or at a time of day when blacks were a greater share of the ridership), but I doubt that’s what happened here. What, precisely, is not true? There is no demonstrable benefit I can see for charging someone with a crime for any type of fare evasion under a POP system, no matter what the intent is – at least not until the point is reached where the evader isn’t paying civil fines. If civil fines aren’t making up for the damage caused by evasion, you’re doing POP wrong. Assuming anyone enforcing laws will do what they should is quite a leap of faith sometimes. Limiting their power protects everyone subjected to it. I said as much, but I’m not sure there is any limit on Amtrak police conducting their own ticket checks. Though the reasons probably have little if anything to do with whether you actually paid a fare. Getting caught persistently and deliberately evading fares warrants a criminal prosecution at some point. Check everyone. Unless their is a complaint about someone not paying, just start at the front and work your way back inspecting everyone and fining whoever doesnt have a ticket. This legal decision is not clear. So it’s unconstitutional for the cops to check everyone, but it’s ok for a civilian official to do so – because civilians are not subject to bias? Yet at the same time it’s also ok for the cops to selectively check just those who they have a “reasonable suspicion” of having evaded the fare? In the case of singling out individuals, there’s not as much cause for concern over bias or infringing individual rights? This sounds like something a judge in Cleveland would come up with. I don’t think it’s an issue of the author’s bias here. it seems more like a judge who doesn’t understand how to apply the constitution – in addition to an author who doesn’t know how to report upon legal decisions and their implications. So, while I wish I could share your certainty that police officers have some well-founded intuition as to what groups are more likely to commit what offenses, the fact remains that human judgment is very fallible and not very good at recognizing our own biases. Why? If you can just make money off the people doing it, what difference does it make? Given the added costs of prosecution, I don’t see that argument holding water unless and until they aren’t paying fines when caught. I cannot speak to speeders specifically, but it’s hardly a controversial fact that blacks commit crimes at disproportionate rates. The problem appears to be a GCRTA police department that is mis-managed, combined with a disjointed fare vending system plus differing validation of fare that varies from line to line. Combine that with a person who paid but was then givne nothing to prove it and you have a really messed up and confusing situation. Now the cops are off the buses but they are still allowed to patrol and check fares on the Heath Line “platforms”, some of which are just fancy shelters on the Euclid Avenue sidewalk. Reports are that travel time has doubled, which will soon start to impact ridership. Fantastic in a city that has seen transit use drop from 129M per year in 1980 to 43M last year. If that were the case, there would be many people who drive too fast with criminal records for their trouble. We wouldn't throw people in jail for shorting a parking meter $3. And we shouldn't do it for transit riders either. We have the technology right now to revolutionize transit fare payment in ways that make transit systems faster and more user-friendly, via features like tap-and-go payment and all-door boarding. All-door boarding can speed up heavily-used bus routes and improve customer satisfaction. But transit agencies have to fully commit to the new policy to realize the benefits.